India 3-131 (Virat Kohli 36*, Suresh Raina 35*, Shikhar Dhawan 30, Bilawal Bhatti 1-17) beat Pakistan 7-130 (Umar Akmal 33, Ahmed Shehzad 22, Amit Mishra 2-22) by seven wickets. Pakistan managed 130 runs after losing seven wickets in the allotted 20 overs and India chased the target by smashing 131 runs with seven wickets in hand and nine balls still available. Amit Mishra (India) was declared ‘Player of the match’ for his impressive bowling spell of 2-22. The ICC World T20 – 13th Match, Group 2, was played on Friday, March 21, 2014, at Shere Bangla National Stadium, Mirpur. Earlier, MS Dhoni, the captain of the Blue Shirts, won the toss and invited the Green Shirts to bat first. Kamran Akmal was gone at 9 as the skipper of Pakistan, Mohammad Hafeez, and Ahmed Shehzad assembled in the center. Both batsmen went back to the pavilion until the score touched 47 in 8.2 overs and put their team under pressure right away. Umar Akmal along with Shoaib Malik tried to mend the early loss and they crept to 97 in 15.2 overs. The latter departed for 18 and Umar Akmal followed him six runs later for 33. Sohaib Maqsood scored 21 off 11 and Pakistan reached 130 for the loss of seven wickets in 20 overs. Amit Mishra was the best bowler with two wickets whereas Bhuvneshwar Kumar, Mohammed Shami and Ravindra Jadeja shared one wicket each. Rohit Sharma and Shikhar Dhawan took off perfectly by scoring 41 runs in the first six overs. The latter surrendered his wicket at 54 after contributing 30 and was replaced by Virat Kohli. Pakistan came back in the game by taking two quick wickets with the addition of 11 runs to the total. Sharma was clean bowled by Saeed Ajmal for 24 and Bilwal Bhatti uprooted the stumps of Yuvraj Singh for just one run. Suresh Raina got in next and had a lucky break when he was dropped at seven by Shahid Afridi. The chance was availed nicely by the batsman who got his rhythm by hitting a few boundaries while Kohli kept on consolidating at the other end. Raina hit the winning run, he remained unbeaten for 35 and Kohli secured his end for 36 as the Men in Blue hammered 3-131 in 18.3 overs. Saeed Ajmal, Umar Gul and Bilawal Bhatti were the only successful bowlers with one wicket each. 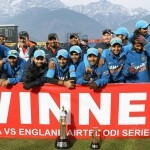 India clinched the game convincingly with a huge margin of seven wickets and got two points.